Part of owning great clothes is learning how to take care of them. Of course, we always recommend following the manufacture washing directions, but here are a few tips we’ve learned along the way. Hand washing is always more gentle than a machine. When machine washing delicate fabric (such as merino), a laundry bag is always a good idea. Front loaders are more gentle than top loaders, and a gentle/delicate cycle with cold water is also a good idea for delicate fabric. We love Kookaburra Wash or Eucalan for washing, especially merino wool. If hand washing, these detergents have the added benefit of not needing a rinse. 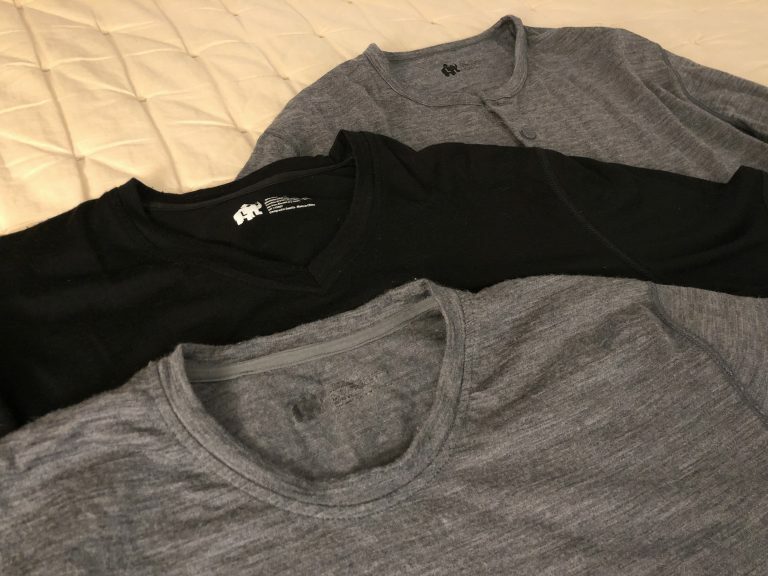 Since much of the clothing we talk about is made from performance fibers (synthetics and merino), the dryer is usually not necessary (and just adds unnecessary wear). If your clothing gets wrinkly (and the care instructions allow), a steamer is more gentle than an iron. Always wash with cold water and a detergent containing lanolin (oil that is naturally in wool) and never machine dry. Usually hanging or laying flat to dry takes care of any wrinkles. If you are hand washing, roll in a towel before hanging rather than wringing to avoid stressing the fabric. Follow the washing directions (but it never hurts to wash cold and skip the dryer) and be careful of hot surfaces (such as irons and camp fires), as synthetic materials will melt. Outdoor Research (OR) makes a number of zip-up tops and I’ve been giving the Sequence L/S Zip Top a workout recently. OR uses some very interesting fabric in this top, with some surprising odor resistant properties. With a slim fit and a light fabric, this shirt works great as a next to skin layer, whether that’s as a base layer or a shirt. The Sequence top is made with drirelease polyester (88%) and merino blend (12%) with FreshGuard technology. The drireelease fibers claim to have unique moisture wicking and evaporating properties. OR even claims that this fabric dries four times faster than 100% wool while being even warmer. 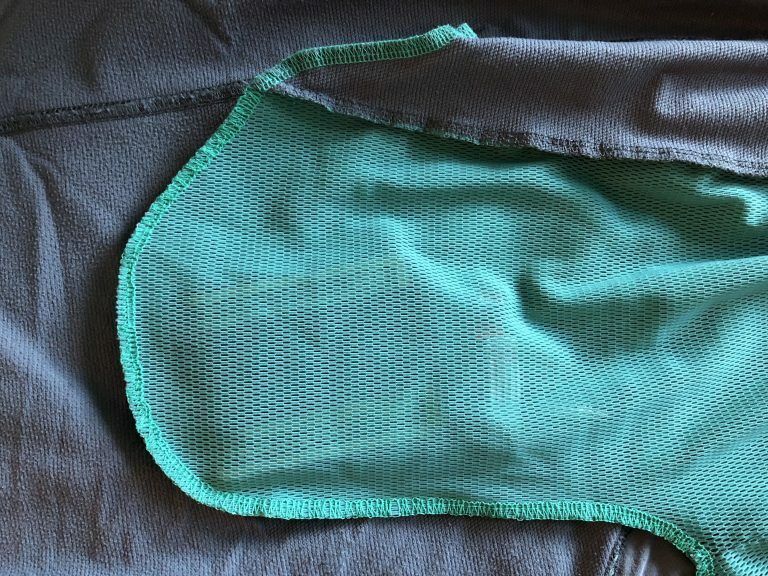 FreshGuard is proprietary, but the fabric manufacturer claims that it prevents odors from growing rather than attacking bacteria. 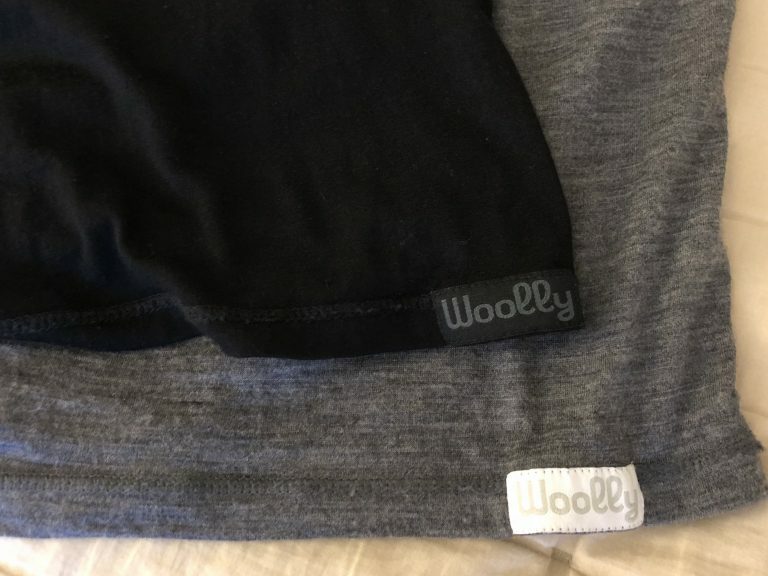 When I first purchased this shirt, I was skeptical of how well the odor resistance would actually work (due to the low merino content). After wearing the shirt while traveling, I can say I am thoroughly impressed. Even after three wears, I could detect no odors. I ended up wearing the shirt five times before deciding to give it a wash. The real test will be to see if the odor-resistant nature will reduce with wear/washing. If the “FreshGuard” is some kind of treatment, it probably will. The shirt is slim cut and very thin, as it is designed as a next to body piece. I find it to be very comfortable as a shirt (with an undershirt) or a base layer. Worn as a shirt, the Sequence is very warm while not being too hot. This is typically a property I’ve only found in shirts with much higher merino content. I’ve gone from wearing this shirt through the airport with a backpack to cool weather and never once felt damp or too cool. Yet on the warm plane or in the afternoon sun, I was never too warm. The seams on the shirt are great and don’t cause any hot spots, even with a backpack. 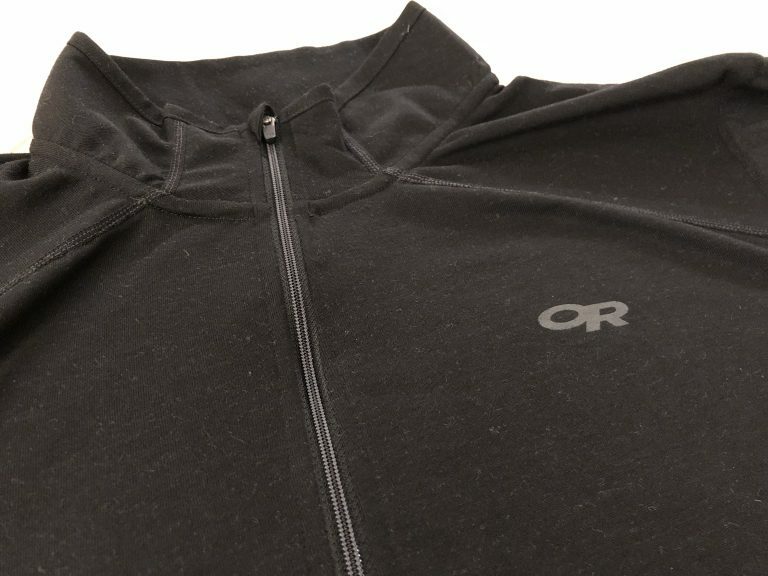 The OR branding isn’t too obvious, and the zipper is the perfect scale and has a nice lockdown tab (to prevent that annoying jingle). The only issue I’ve had with this shirt is pilling. 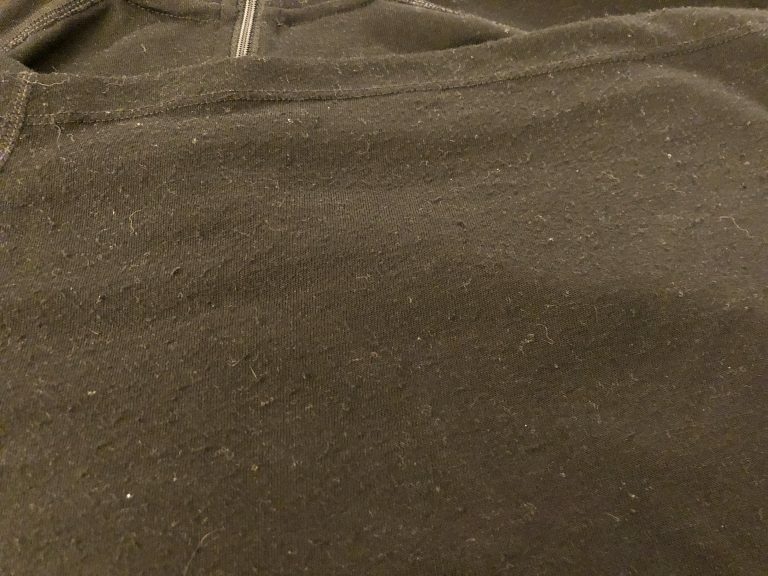 After taking my first trip with a backpack, the shirt has developed some pilling on the back where the bottom of the backpack was resting, as well as in the underarms where straps could have rubbed. For me, this isn’t a dealbreaker, but definitely something to consider before making the purchase. The Outdoor Research Sequence L/S Zip Top was certainly a surprise with its excellent odor-resistant properties. It has become my go-to shirt for cool fall weather and I see it becoming a staple for the winter, whether as a shirt or base layer. Note: this blazer was provided by Bluffworks for the purposes of this review. If you’ve ever searched “travel blazer” then you are likely to know that most offerings look — well they don’t look particularly great. These blazers tend to focus more on wrinkle resistance and “secure” pockets than they do on style. So the more you look, the more likely you are to give up. That’s where Bluffworks comes in with the Gramercy Blazer — the goal being to make the best blazer you can get for travel and life. They’ve set the bar quite high for themselves, so let’s see how they did. Fit of any blazer, off the rack, is always a bit of a gamble and will largely depend on your body as much as it does the overall cut. That said, the Gramercy fits me very well, with plenty of room for a light sweater over my button up, or just the button up. More than the fit itself, is how well the blazer moves as you wear it — this adds greatly to the comfort of the jacket. I followed the sizing guide very closely when choosing a size and that’s your best bet with this blazer. The fit is also helped by there both being a standard cut and a slim cut. As someone who typically needs a long jacket, I found the regular had plenty sleeve length. 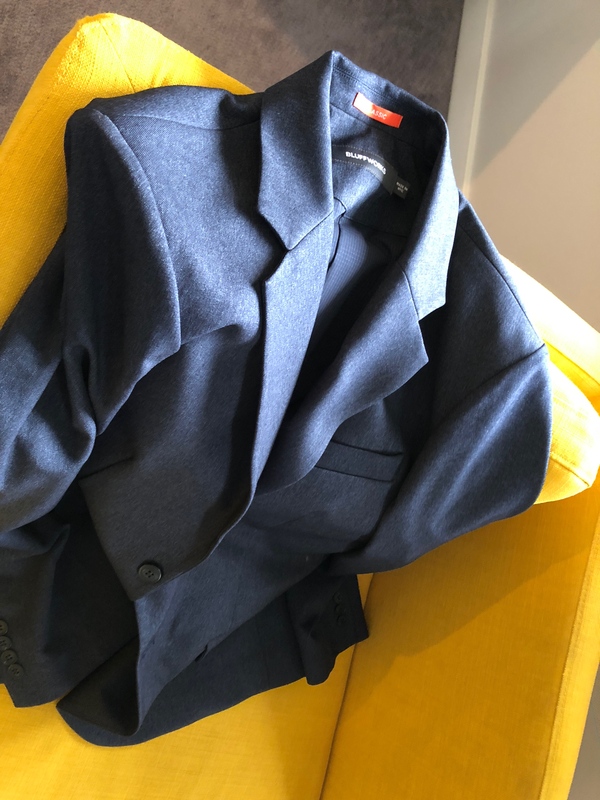 As I mentioned in the opening, the biggest issue you often run into with a travel blazer is that it looks like a travel blazer. The Gramercy looks nothing like a travel blazer. You might notice up close that it’s not quite a normal looking wool blazer, but you’d really have to look closely. You give nothing up with this blazer. The Blue Hour color I chose is a fantastic and versatile color. It’s best to compare this with a standard blazer, than it is with other travel blazers — it’s too far ahead of the looks of any other travel blazer. There are three features of this jacket which make it a travel blazer: washable, no wrinkles, and pockets. I’ll talk about laundering it later, so for now let’s focus on the other two. The blazer comes folded up (who knows how long it sits like that) and yet there were only light creases in the sleeves. I’ve left it wadded in the corner, I’ve driven on long drives with it on, and otherwise done things with it that I might not normally do with a blazer. For the life of me, I can’t see a wrinkle. I’ve not folded it up and shoved it in a suitcase for travel, but then again I would tend to wear this on the plane, not pack it. It’s really good at resisting wrinkles. I get annoyed with people slapping a few dozen pockets on a jacket and calling it a travel jacket. It’s beyond silly. Bluffworks is walking a fine line here. There’s your standard exterior breast pocket, as well as two hand pockets on the front. There’s nothing non-standard about these pockets, which is refreshing. Inside the jacket there’s a bevy of pockets. There’s two inside breast pockets. The left features a button closure, and a dedicated pen pocket which is nicely confined from the main pocket so your pen doesn’t scratch your phone. 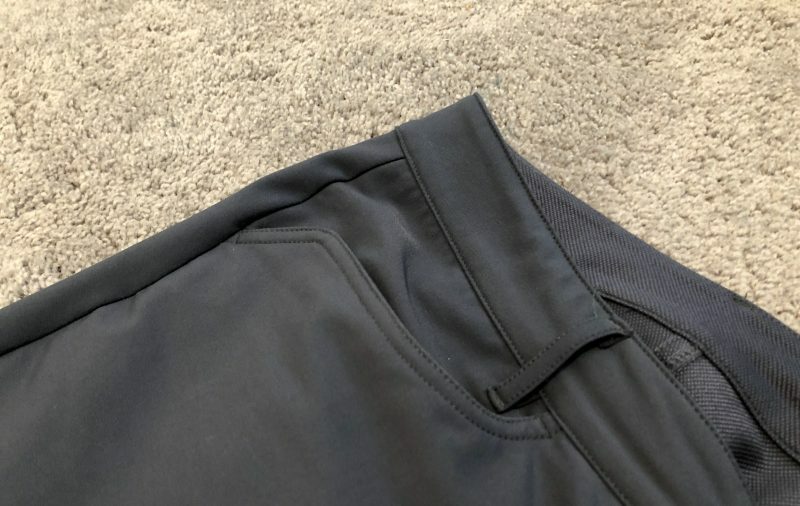 On the right there’s a zip close pocket. Which has a zipper pull that never jingles and never gets in your way. Moving down the inside of the jacket there are two more pockets you’ll need to open with a seam ripper (if you want, I’d recommend you don’t). These are both giant pockets and can hold a lot of stuff. They have no fastener to secure them closed, but they are deep. 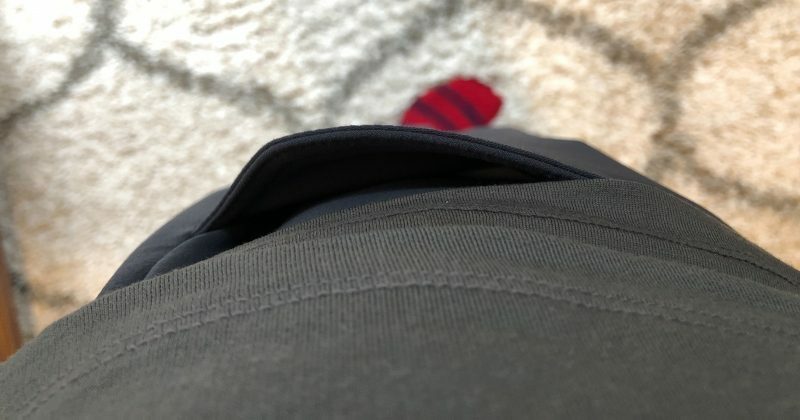 The issue with these pockets is when you put anything with weight in them. Doing so tends to quickly telegraph through to the front of the blazer and causes the bottom edge of the blazer to bulge. It’s not a great look. You could drop a small notebook or some business cards in here, but you need to be careful. If looks are your top priority, I’d leave the pockets sewn closed. 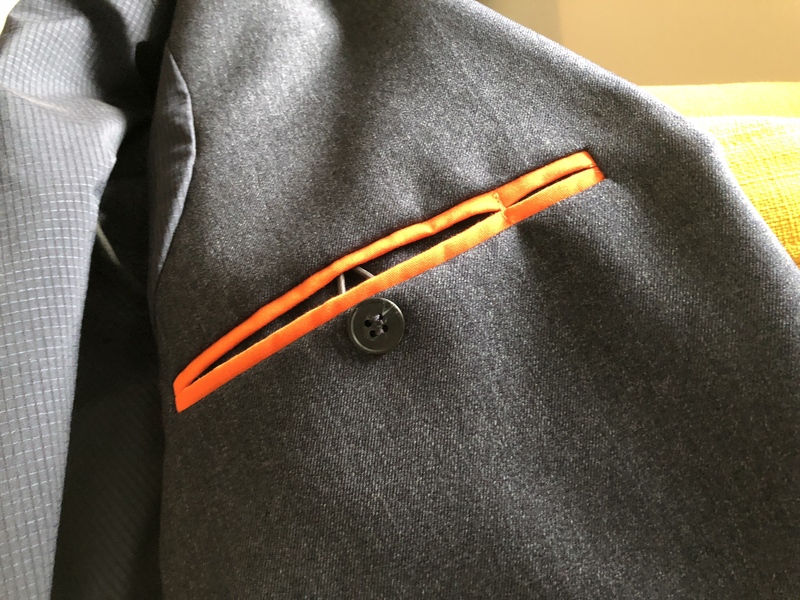 Lastly there’s single pocket which vertically zips closed at the back tail of the blazer. It’s an odd pocket, and Bluffworks shows it being used to hide cash. I can see that, as cash wouldn’t be too bulky or uncomfortable when you sit down. Otherwise, the pocket can almost be forgotten about. What sets this jacket apart for me, is that even though it has these “standard” travel features, they don’t detract from the jacket. If you want to wear this as a normal blazer, you can, and you won’t pay a penalty for choosing one with extra pockets. Well done. My single biggest concern with this jacket was the material. All Bluffworks says is: “100% technical, breathable quick-dry polyester. Mechanical stretch.” When I read a statement like that I think of something that will make a swishing sound as you wear it, and won’t really stretch. Let’s look at stretch first. Stretch is incredibly important for comfort, and mechanical stretch means there’s not stretchy fabric like spandex or elastic in the garment. And yet, you might think there is in this blazer, because it stretches a bit. Not enough where you feel like it’s a stretchy jacket, but enough that you appreciate it when it does move with you, which is perhaps a better way to describe it than using the word stretch. So what about the hand feel? The fabric is soft and smooth. There’s no more sheen than on my wool suit, and it makes no more noise than my wool suit as the material rubs against itself. Simply put: if I didn’t know better, I wouldn’t think this was polyester. It doesn’t look or feel like it. The jacket feels great. The material is great. It’s breathable while being heavy enough to have solid structure. However, it won’t be warm. A couple weeks ago Bluffworks sent an email telling you how to wash your Gramercy blazer. Now if you’ve owned a blazer before, you know you take it to the dry cleaner. This blazer can be put in the washing machine and will be no worse for wear. Normally I would file this under “good to know”, but given that I didn’t spend my hard earned money on this blazer, I decided to give this a go and see what happens. I washed the blazer following those steps almost exactly (I dried it for only 8 minutes as I had to leave the house). When I first hung it to dry it looked a little sad — droopy. However, after it fully dried (took about 8+ hours) it looks exactly as it did before I put it in the wash. That’s a bit more magic. Looking at it very closely I can tell that the lapels have lost a little bit of the press, however that seems to have gone away after wearing the jacket again. You would think machine washing a blazer would be a catastrophe, and it would be, except with this blazer. 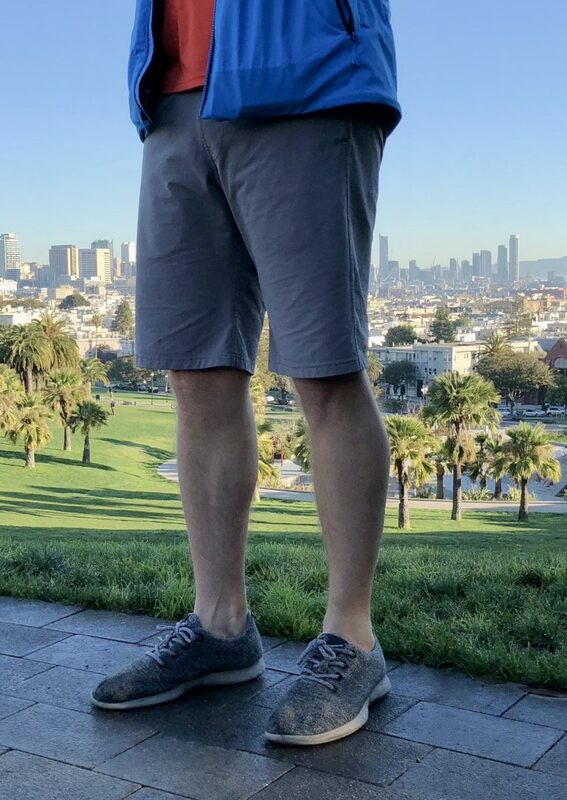 One issue I always run into is what to wear when I travel. Often a button down is all I need, but sometimes I get a slight chill — this blazer is going to be my new go to. It looks sharp, performs well, and is comfortable. I was worried about a lot of things with this blazer, and they were almost all immediately proven wrong when I pulled the blazer out of the box. I really love this blazer. Bluffworks calls it the “ultimate travel blazer” and I concur. You can grab one from Bluffworks here. We’ve posted a new guide all about activewear clothing choices.